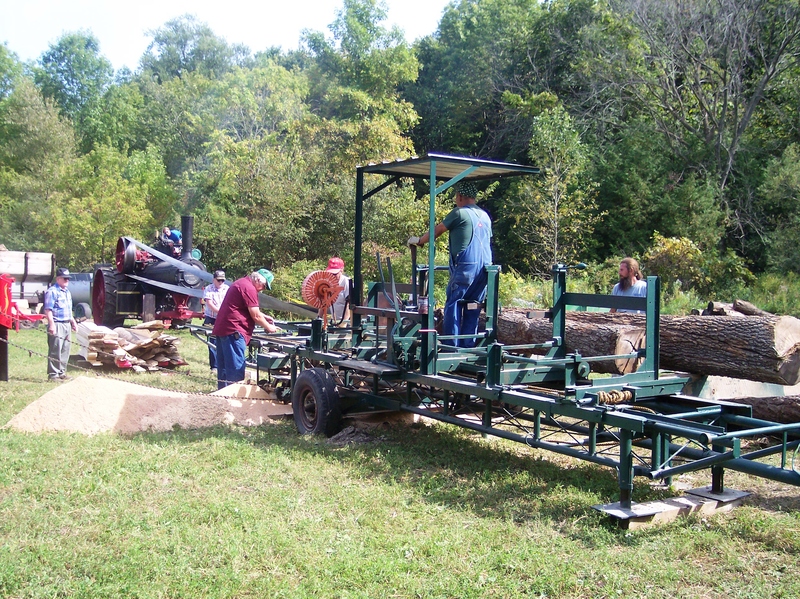 Members of the Richfield Historical Society cut logs during a working demonstration at the Richfield Thresheree. Richfield (population 11,336) is located in Washington County near Milwaukee. Ceded by the Menomonee and Potawatomi tribes in the 1830s, the land was settled in the 1840s by German, Irish, and English immigrants. The land was well suited to subsistence farming, wheat production and dairy farms. The coming of the railroad gave rise to passenger traffic to summer recreation spots on local lakes and the nearby Carmelite shrine at Holy Hill. Richfield became a bustling center with two hotels and a full complement of commercial establishments. With the advent of the automobile, Richfield evolved into a suburb of Milwaukee, with a mix of residential, business, manufacturing, and light industry. In 1999, the Village of Richfield purchased the 27-acre Messer/Mayer Mill property and established the Richfield Historical Park. The Village has partnered with the Richfield Historical Society, which has rehabilitated the gristmill (ca. 1871), mill house (1860s/early 1900s), and associated outbuildings. The Historical Society also has relocated several buildings to the property to interpret as a Pioneer Village. Richfield Historical Park is the site of the annual Thresheree, which features demonstrations of historical agrarian equipment and techniques. Tours of Richfield’s historic downtown are available during the Richfield Days annual celebration. Visitors can also learn more about the community’s history through a driving tour created by the Washington County Landmarks Commission.